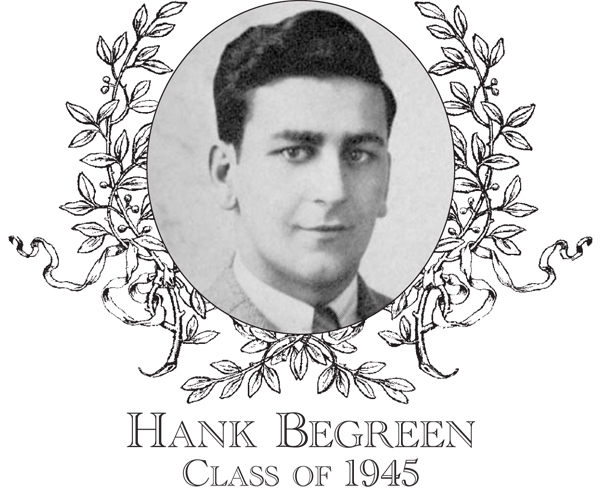 According to legendary Bartlett Hall of Fame coach George Finnegan, Francis �Hank� Begreen was one of the most gifted natural athletes ever to don the Green and White. Hank was a three-sport star, participating in football, basketball and baseball. In the fall, Hank played football and lined up offensively at both end as well as running back and at end on defense. In his first game against Palmer, playing halfback, he scored on a sweep, threw a touchdown on a halfback option, kicked an extra point and finally ran in a fake extra point. In his last game, in a mighty defensive struggle versus Wells, on Thanksgiving Day, he scored a touchdown, caught numerous passes, and managed to to keep Southbridge at bay the entire game with his booming punts � including the longest punt in Bartlett history, a recordbreaking 92 yarder. In the sport of basketball, he once again took advantage of his size and power. On the boards, his rebounding skills on both ends of the court made him a force for the (17-3) Finnegan-led Indians. Offensively, he had a nice soft touch, especially when in close. In his senior year, the biggest game of the season was the match-up with Catholic League Champions, (18-3), St. Louis Cavaliers. Hank went on to score a game-high 26 points, and was described by the St. Louis fans as an �unstoppable force.� At the end of the season, he was named to the Red Cross Schoolboy All-Star Team which played Connecticut in the post-season. In the sport of baseball, the big left-hander manned first base for the Indians. Defensively, he was described as being �very smooth with excellent range, and on offense a powerful hitter.� In Hank�s junior year, he led the team both in RBIs and homeruns. At that time, Bartlett played at Marcustry Park on West Street and according to a number of fans the big lefty hit a ball that cleared the barn in right field which was a distance estimated in the 400-foot range! In the spring of 1945, Hank would forgo playing baseball and joined the U.S. Army, serving his nation proudly. On his return from the military, he would play two years of semi-pro football. Hank and his wife, Patricia, had four children: Deborah, Mark, Paul and Caroline. He remained in the Webster area and operated a number of local businesses.